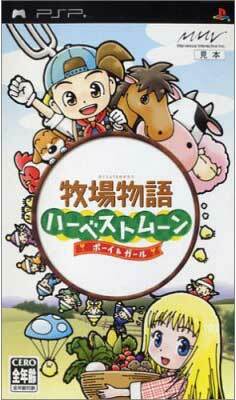 Introduction: The first version of Harvest Moon to be released on the PSP console is simply a port of the Ps1 game Back To Nature and it's girl-version remake. When you start the PSP game you can choose which version of the Playstation 1 game you wish to play. The boy version does not have an ending, but the girl side of the game will end once you have proposed marriage. 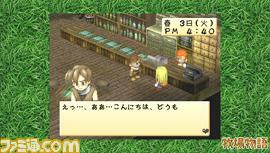 The girl version was never localized into English until Natsume announced plants to translate the game in the company's E3 2007 game announcements. The only thing added to the PSP version is the ability for you to make the game play in normal television 4:3 mode or wide screen to fill in the PSP's screen width. If you don't expand your view, the outside areas are filled with a grassy texture. You can switch between the two screen formats by triggering an option on the bookshelf inside your house. The game was released a second time in Japan in November 2006 as part of the BEST collection, a series of popular PSP games relaunched with a lower price and a big yellow sticker slapped on the package.